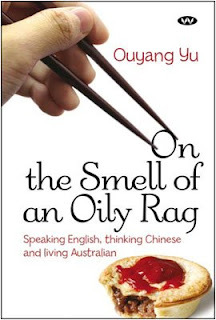 I'm off to China for a semi-business trip and I'm reading the excellent book by Ouyang Yu , On the Smell of an Oily Rag in preparation. It's loaded with cross-cultural references and observations of what it is to be a Chinese Australian. My favourite cultural confusion so far is that the Yahoo! search engine is mixed up with the Chinese ya hu meaning an elegant tiger. The introduction makes an interesting point about our cultural exchange: China purchases 50,000 titles from the West every year, while the West returns the favour by buying only 2000 titles. The imbalance is surprising. With the Chinese diaspora and the increasing interest in all things Olympic, you'd expect a few more titles to come our way. Apparently not. Ouyang's book approaches both audiences and hopefully isn't an example of another of my favourite Chinese expressions: dui niu tanqin, which according to The Meaning of Tingo means "to play the lute to a cow".